I came home to a new Plan B box today, my first since the fall. A lot of greens, a cucumber, tomatoes, apples, mushrooms, and asparagus – which reminded me that I still had a bunch of asparagus in the fridge to cook up. So I made this Jamie Oliver asparagus soup recipe that I found recently. It’s very simple, served with toast and a poached egg. I made a half recipe, which worked about right for a single bunch of asparagus (which, before I trimmed the bottoms, came to 450 g). I didn’t have any leeks so used 1 1/2 onions, but it would be better with leeks. The truth is, I haven’t been excited about asparagus lately, but this soup was far more interesting than just steamed asparagus. I might serve the leftovers with grated cheese or even kefir mixed in. I used to always use those powders to make soup, but I’ve made the switch to homemade stock. It’s delicious, easy to make and a good way to make use of leftover vegetables. The recipe I always use is from the Rebar Cookbook (which everyone should own, by the way), but adapted for my own tastes. And you don’t have to be exact with quantities – use what you have. I always put my leek tops and shiitake stems in the freezer so they’re ready for making stock. You can do this with a lot of vegetables and it means less waste and an easier job cooking. 1. Peel and roughly chop the onions, leeks, carrots and celeriac. Separate the garlic bulb and smash the cloves with the flat of your knife. Quarter the apple. If using whole mushrooms, chop them roughly. 2. Heat oil in a large stock pot and add the onions, leeks, carrots, celeriac, salt and bay leaves. Sauté for 5 minutes, stirring often. Add all of the remaining ingredients, starting with the water, and bring to a boil. Reduce heat and simmer gently for 45 minutes. Strain and cool if not using immediately. Store in the refrigerator for up to 3 days, or in the freezer for up to 2 months. No pictures today but two good, simple recipes. I took this asparagus soup recipe from epicurious.com and made it this weekend almost verbatim – just used onion instead of shallots. It was fine the first day, but really good the second and third. 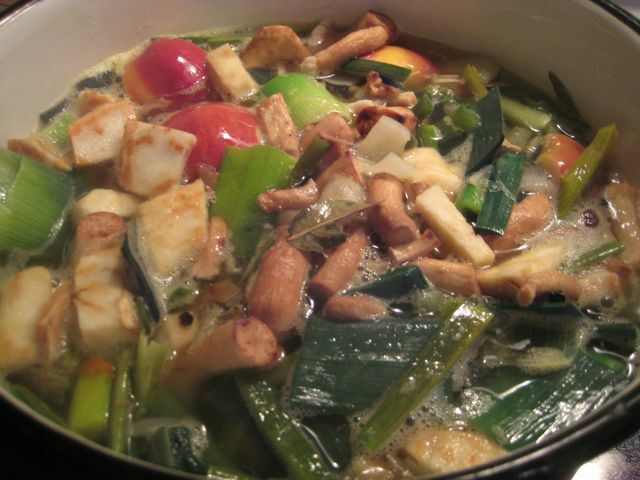 I made a fresh vegetable stock mostly out of green garlic tops from my Plan B box and it added a lot of flavour. Be careful not to oversalt this soup as it has a very delicate flavour. And tonight, I boiled up some red potatoes and tossed them in pesto. I had arugula and made it with pistachios and cheddar (partially inspired by this recipe) but you can use any greens and nuts you have around. Be careful with the garlic quantities. It’s a nice, simple way to prepare potatoes in the summer.